I've been blogging in various locations across the world wide web since the year 2000 or so, in homeschooling and homesteading communities, as well as out on my own. Part of me regrets not staying in one place, but sometimes a new season in life needs a new blog, so here we are. I hope that you will find pleasure in my entries. I hope you will find yourself chuckling at times and challenged at other times (or the at the same time. Whatever blows your hair back). I hope you will find thoughts to which you can relate. I hope that my delivery is such that you will at least begin to understand a thing or two that maybe you found you couldn't relate to before. I am a busy woman, raising seven children at home and keeping up a small homestead on top of writing my next book, so much of my blogging is in short essays and life updates that I can get down in a sitting or two between meals, homeschool, "The goats are out!" and "He ate my crayons!" Here you will find bits and pieces that I manage to squeak out, in no particular order and on no particular subject; astronomy, religion, living as an unbeliever in the Bible belt, raising children, gardening, various homestead adventures, and so forth. My recently published book contains full essays and entries in chronological order from late 2012 to late 2013, as well as never-before-published pieces, chronicling my life after leaving religion. 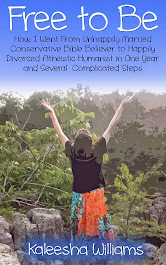 So, if you like what you find here be sure to check my page kaleeshawilliams.com for details on how to buy my book, "Free to Be: How I Went From Unhappily Married Conservative Bible Believer to Happily Divorced Atheistic Humanist in One Year and Several Complicated Steps." If you enjoy my writing and would like to support me, be sure to visit my Patreon page, where you can pledge a small (or large, I have no problem with large) monthly amount, earning some small perks and helping to free me from some of our worldly confines so I can offer more content and write some more books. Read softly and carry a big highlighter.